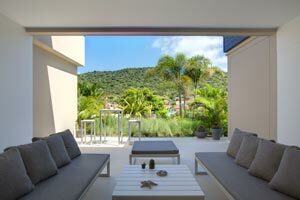 Apartment UJV 402, also knonw as Camille, is ideally located in Gustavia, St Barts. Offering one bedroom, this apartment is modern and stylish, within walking distance to Shell beach and town. Apartment UJV 402 has an indoor and outdoor living area, each comfortably appointed with sofas and chairs. The indoor living area is shared with the small, well-equipped kitchen area, which is perfect for preparing light meals that can be served alfresco on the intimate terrace or at the indoor dining table, which seats two. The bedroom has a queen-sized bed and built-in closets with drawers, maximizing the use of the well-designed space. The bathroom is designed with clean lines and a soft tone and has an open rain shower with a built in shower seat. Apartment UJV 402 is an ideal accommodation for an intimate getaway with the added luxury of the beach and nightlife within a few minutes walk.